GSMArena team, 20 July 2016. 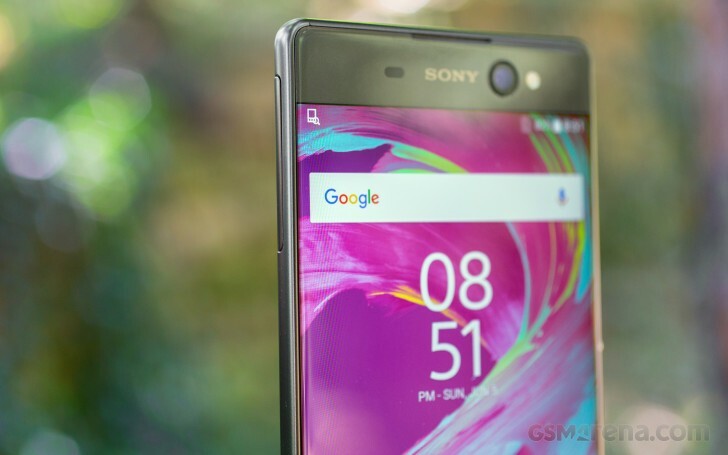 Sony's new X line of smartphones come with Android 6.0.1 Marshmallow out of the box. As always, Sony brought its own media apps - multimedia is its bread and butter after all - but core changes to Android are relatively few. The software does weigh more than the typical AOSP installation. The Xperia XA Ultra is available only with 16GB of internal memory and you're left with about 8GB of that. A microSD card is a must as apps, photos, videos and music will quickly eat up the available storage. The lockscreen is customized to show off the Xperia theme (the numbers of the clock are see-through so you see the wallpaper through them). You can swipe left or up to unlock, down to view notifications. You can't swipe right to unlock, though that's not much of an issue after the first hour or two with the phone. The homescreen appears unchanged. This includes the swipe down gesture, which shows a screen of the apps you use most along with recommendations for new apps to install. A search field is highlighted so you can start typing the app's name immediately. The traditional app drawer is still on board and it features an above average amount of vendor apps. Sony takes great pride in their AV prowess, so there is no way that they could have gone for the stock multimedia apps made by Google. Themes are available (both free and paid) that can customize the look and sound of the Xperia XA Ultra interface. The notification area is plain Android. You can re-arrange the quick toggle tiles and adjust the screen brightness. Note that just like in vanilla Android, there's no toggle for Auto brightness (you need to go into the settings for that). That's the one thing we don't mind skins changing and still, many manufacturers like to keep it stock. We have to say we don't appreciate the spamminess of Sony apps - the notification area is full of reminders, suggestions and other prompts. Anyway, the app switcher is similarly a vanilla Android affair with the 3D rolodex look. The small apps are gone, however, and there is no longer floating app multitasking. The Smart cleaner feature will periodically empty the cache of apps you haven't used in awhile. You can switch this off or just manually tell it not to bother for certain apps. One thing Android has been missing for years is a proper backup solution and Sony gives you one. It can backup applications, contacts, messages, phone settings. The backup info itself can be stored on your Sony online account, on the microSD card or an external USB device. Backups can be scheduled, including conditions like "Connected to Wi-Fi" and "Charging device", depending on your preferences. One-handed mode can be enabled with a swipe gesture. It shrinks the screen to more manageable levels and is helpful when you need to reach something, but can't use both hands. You can flip the shrunken screen to the left or right-hand side and adjust its size.